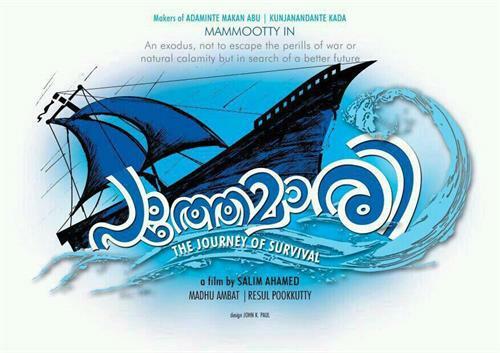 Pathemari malayalam movie (film) to be directed by Salim Ahammed will have Mammootty in lead. The movie tells the hardships and experiences of malayalis living in gulf countries. Sreenivasan, Siddique, Salim Kumar, Joy Mathew and Yavanika Gopalakrishnan would also be seen in prominent roles. The story revolves around half a century of sufferings that the gulf migration gave to the people in the state. The life and dreams of gulf malayalis in search of a better life would be visualised. Salim Ahamed who has made Keralaites proud with his first movie 'Aadhaminte Makan Abu' is gearing up to entertain the audience with his latest project which tells the hardships and experiences of malayalis living in gulf countries. After 'Kunjananthante Kada', Salim Ahmed will team up with Mammootty yet another movie titled 'Pathemari'. Sreenivasan, Siddique, Salim Kumar, Joy Mathew and Yavanika Gopalakrishnan would also be seen in prominent roles. The movie which comes with an attractive tagline, 'the journey of the survival', will be an exodus, not to flee the perils of war or natural catastrophe but in search of a better future. The story revolves around half a century of sufferings that the gulf migration gave to the people in the state. The life and dreams of gulf malayalis in search of a better life would be visualised. With uniqueness in presentation, the movie would be a different experience for the audience. Scripted by Salim himself, Madhu Ambatt will wield the camera. Oscar winner Rasool Pookkutty will handle the sound recording of 'Pathemari'. Gulf being Malayali's El Dorado where people flock over to seek fortunes, Pathemari unfolds the story of two friends Pallikkal Narayanan and his buddy Moydeen who explore abroad in a pathemari. They spend about 50 years of their life under the feet of Arabs in an intense hardship. The shift of life in both the nations is soulfully narrated describing the exotic hard labour and difficulty of the emigrants. As Kerala is having a rare connection with the people who have immigrated to Arab countries, it would be a new experience for the audience. After the pre production works, the movie would start rolling at Dubai. Mammootty has already committed a number of projects which include those under big banners. His upcoming movies include 'Munnariyippu', 'Manglish' 'Varsham' and a couple of untitled projects.